New on Fantastic Reviews is Aaron's in-depth interview with Colorado author Paolo Bacigalupi. Paolo Bacigalupi is a new author, but his powerful short fiction has quickly established him as a rising star of science fiction. His stories "The People of Sand and Slag", "The Calorie Man" and "Yellow Card Man" were nominees for the Hugo Award between 2005 and 2007. "The Calorie Man" won the 2006 Theodore Sturgeon Memorial Award, and "The Fluted Girl" was on the shortlist for that award in 2004. Paolo's first book, Pump Six and Other Stories, is just out from Night Shade Books. It collects all of his short fiction to date, plus the original title story. The Book of the Week is Jumper by Steven Gould, in honor of the film version opening this weekend. Jumper is the story of Davy, a young man who discovers he has the innate gift of teleportation (or "jaunting" as Alfred Bester called it in his 1957 classic The Stars My Destination), an ability that complicates his life more than one might expect. Teleportation is a favorite theme of Steven Gould, figuring in three of his seven novels. His other favorite topic is environmental concerns, central to three of his novels, including one in collaboration with his wife, also a successful SF writer who we will see in next week's BOTW. 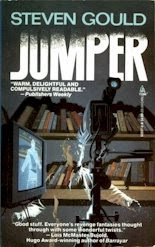 This is the first paperback printing of Jumper, published in 1993. It is not especially valuable, but perhaps will become so if the movie is any good. One never can be confident of how Hollywood will adapt a science fiction novel, which is why Steven Gould has recently been spotted wearing a t-shirt that says, "Never judge a book by its movie." The preview looks good, but initial reviews are not promising. (A rather common pattern -- what a happy tradeoff it would be if Hollywood were not so good at making trailers and a little better at making movies.) After introducing Steven Gould's wife next week, the following week's BOTW will be another novel that was adapted by Hollywood recently, one that definitely is a collector's item. There were many fewer novellas published last year than novelettes and short stories. Out of this relatively small pool, by far my favorite novella of 2007 was “Sideways from Now” by John Meaney, a terrific combination of hard SF with a New Weird sensibility. It is a testament to the amazing talents of Orson Scott Card, Dan Simmons, and Connie Willis that their respective stories merit award consideration even thought they all fall short of the authors’ very best work. I’d especially love to see Orson Scott Card get a Hugo nomination, just to annoy the tolerance police who insist that Card should not win awards because they dislike his political and religious beliefs. As with the short stories, I will update this if I encounter other worthy pieces this month, and I welcome other suggestions. Unlike the novella and short story categories, there was no single novelette that was a clear favorite for me. Forced to pick one, I would probably go with “Glory” by Greg Egan, far-future SF as only Egan can do it, combining interesting hard science speculations (including a method of interstellar travel I’ve never seen before in the first two pages) with thought-provoking human issues. I have always been a big Greg Egan fan, and of the three stories of his I read last year (I never saw a fourth, from the magazine Foundation), this was my favorite. Incidentally, anthologies generally don’t identify whether a piece is a short story, novelette, or novella, and it’s not always easy to tell. Apologies if I mislabeled any of these.